I have a 2006 H-D Dyna Wide Glide and a 2010 Road Glide Custom, both of which I have done some significant customization. I have saved many of my parts from these bikes as I've replaced the stockers w/ my new goodies. I've been wanting to build a custom bobber for some time, and thought it would be great if I could leverage some of my original stock Dyna Wide Glide parts in the process. A couple of years ago I purchased a wrecked roller/donor bike, a Buell 2003 XB9 Firebolt with a good running engine/trans to get the project going. I wanted to do a custom build that would be different than most bobber projects - which tend to use Sporty or big twin engines, and figure if I was going to do a moderately priced bobber build with the Sportster platform, going with the XB was a good idea in my opinion, given the XB's larger cams and awesome heads. Al" Wilkerson of Bitter End Old School Choppers in Iowa and he was able to hook me up with a custom frame build based upon my desired specs. Fast forward to today and I have since received the frame (which turned out great!) 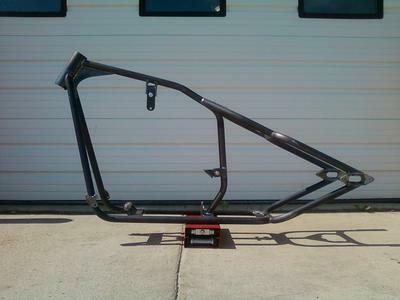 and have begun the bike mock-up process, working with a local builder/fabricator here in southern Oregon - Jerry Mallory of Road Rage Choppers. 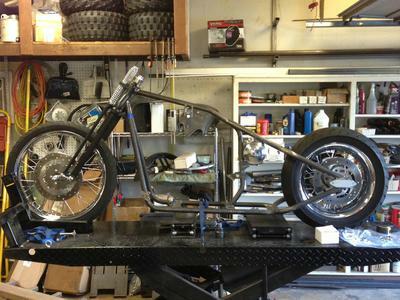 The bike will be a typical hard tail, minimalist bobber with a -2" black springer front-end, Sporty tank, KustomWerks radiused rear fender, sprung solo seat, and 12" mini-ape handlebars. I'm leveraging my H-D 'Profile' laced chrome wheels from my Dyna, along with that bike's former rear (stock) caliper. Things are coming together nicely as I search for the last few parts to finalize the mock-up. Along the way I am changing out the EFI for a carb and new electronic ignition setup, and changing out the stock pulleys and belt for a chain drive conversion. I'm also planning on upgrading the displacement by going from the XB9's stock 984 CCs to 1050 CCs (the largest cylinder jug/piston setup I can go with without having to bore the cases - which is not appealing to me at this time). The frame is a 180-200 tire setup, and that works for my stock Dyna rear wheel, which has a 180 tire on it now. Eventually I will go up to a 200 to more fully fill out the rear fender. I've always been old school especially carburator. and mechanical points or magneto systems because they were simple and you could diagnose a problem easier ( and maybe even fix it and get going) if you were broke down out on the side of the road in East Bumfuck), but I still have to admire these new computerized systems that monitor both fuel, and spark timing to get the most out of your engine. This bike you're building looks like it'll be part of both worlds, with the old styling and modern engine and fuel and ignition systems. Looks like it's going to be a super ride!! Good luck with it. Just want to commend you on your build. Looks swell And sounds like it's gonna be Bitchin ! Join in and write your own page! It's easy to do. How? 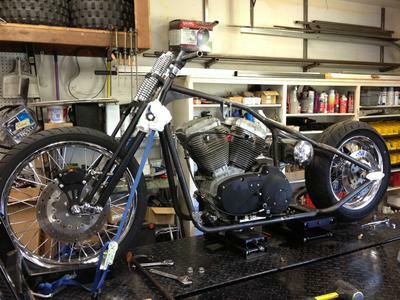 Simply click here to return to Bobber Choppers.